Owning a dog can certainly add an immeasurable amount of enjoyment to the daily lives of a family. The companionship, playfulness, and unbridled faithfulness of a dog are but a few facets of its character that can bring smiles to the faces and warmth to the hearts of its owner-family. 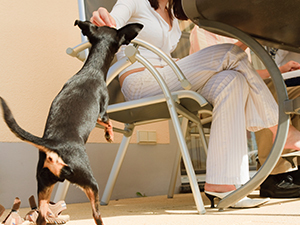 Owning a dog also means accepting the responsibility for its care and well-being. Since a dog essentially cannot fend for itself in many/most respects, it is therefore incumbent upon its owner to provide the environment and the basic necessities that will allow the dog to lead a happy and healthy life. Sometimes, however, through either complacency, a lack of appropriate consideration, or simply because they love their dog, an owner may unintentionally or inadvertently subject the dog to mistreatment. It is very important to reiterate that this discussion will focus on circumstances/actions that are well-intentioned and/or non-deliberate in nature, as the vast majority of owners do not intend to harm or ill-treat their dogs in any way; the fundamental premise here is the difference between the intent of an action and its impact or effect on the dog. It is easy to see how life’s other priorities may get in the way of providing adequate care for a dog or how one’s best intentions can result in undesirable/unanticipated outcomes. However, owning a dog is not just a responsibility, it is a full-time responsibility, and dog owners must therefore consider the possible impact of any actions on the overall health and well-being of their dogs. Perhaps said in another way, due to the utter dependence of a dog on its owner, will an action truly be one of kindness or will it have a potentially detrimental effect? As noted above, do-it-yourself dog training will likely be less effective and might actually be a disservice to the dog. Despite the best of intentions, such an approach could result in inconsistent or incomplete potty training or obedience training, in turn causing a good deal of frustration for the dog and the owner-family, not to mention the development of undesirable behaviours/bad manners on the part the dog. To set the groundwork for a happy and healthy life for your dog, call the professionals at Alpha Paws today at 905-830-9500 or 1-877-868-PAWS (5248) to discuss the type of dog training program that would be best for you and your dog. Owning a dog can certainly add an immeasurable amount of enjoyment to the daily lives of a family. The companionship, playfulness, and unbridledfaithfulness of a dog are but a few facets of its character that can bring smiles to the faces and warmth to the hearts of its owner-family.